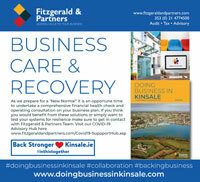 Fitzgerald & Partners are an accountancy firm based in Kinsale, Co. Cork. The business advisory firm has a full range of services available in audit, tax and advisory. The firm has an excellent team to service the requirements of our clients. Our team are good listeners and are keen to understand and work with our clients. The ethos of the firm is that of growth, both growing as a firm ourselves but also to help our clients in developing growth strategies for their business. We work in compliance such as income tax returns and corporation tax returns to consultancy assignments where we act as consultants in a business advisory capacity for small, medium and large clients. We deal with both private and corporate assignments on a totally confidential basis including tax and wealth management. Our office outsourcing - business centre is there to service the needs of our clients in outsourcing aspects of their business such as VAT, payroll, management accounts and we use cloud based technology so that our clients can have their data available on their devices in real time which SMEs need to monitor their business using KPI's. We enjoy working with SMEs and entrepreneurs with the latest in technology and software, provided by our excellent team of CPA's who work both on and off site, travelling to businesses in the Munster area each morning as is required. Our team do regular updates for our clients, in terms of seminars, conferences, quarterly newsletters and social media updates via all the social media platforms. Our niche areas that we particularly enjoy working in are dealing with expatriates, those moving to Ireland and also in the areas of tourism and hospitality, consulting and advisory and a particular focus of working with entrepreneurs. Cormac Fitzgerald FCPA has a special interest in the SME sector and is a large employer in the Cork area. He is the past president of CPA Ireland, one of Irelands leading accountancy bodies and former Cork Business Person of the Year. The firm is well branded and profiled as a leading business advisor in the SME sector, which accounts for 99% of business in Ireland. The firm writes articles for local media, supports events locally in the heart of the community and constantly aims to innovate in areas like on-line accounting. Our Business Centre outsources for SMEs. For a start-up client, the firm provides a start-up guide downloadable on our website addressing starting your own business. The guide is also available through the firm’s referral network. We have also a new innovative App which is free to download. We recently featured as a case study in a global report. The Global report recommends that small to medium sized practitioners and professional accountancy bodies must work together to adapt to change for an evolving future. A global research report ‘The SMP of the Future in a Changing World’ commissioned by the Edinburgh Group – a coalition of 16 accountancy bodies from across the world - examines the landscape ahead for the Accountancy Profession. The report is based on an SMP survey, which gave 1,906 responses in 11 languages from 52 countries, alongside interviews with key staff in Edinburgh Group professional accountancy organisations and a series of SMP case studies. It also includes a review of other academic research into SMPs. We were honoured to be one of the only two Irish CPA firms to feature in the report. On-line accounts represent a growth area. Small start-ups provide their data on a weekly basis, e.g., drop it off, mail it or scan and email. The firm processes the data, inputs it in a package like Big Red Cloud & Surf . A client can access its data while scuba diving in the Caribbean or driving around Ireland. They can invoice from their device. The firm and client all work off one package and in real-time. Clients find value in always being up to date on their accounts in a very simple way. The firm works with whatever package the client prefers (Big Red Cloud, Xero, Surf or an industry specific package). We also have our very own App. The firm views business advisory – private advice on key points in business to help in growth strategy - as the future. A deep dive into a business via a SWOT analysis reveals the issues the entrepreneur is facing. Being a good listener is important. Running a business can be lonely. SMEs find value in an advisor who understands the key issues facing their business, is independent of their stakeholders and gives objective advice. The firm regularly advises on the buying and selling of businesses and the negotiations around same and considered to be the advisor of choice for those considering buying or selling a business. Please contact us on 353-021-477-4500 to see how we can add value to your business.